A new Yale-led study detailing how blood vessels develop could lead to novel treatments of cardiovascular diseases as well as cancer. 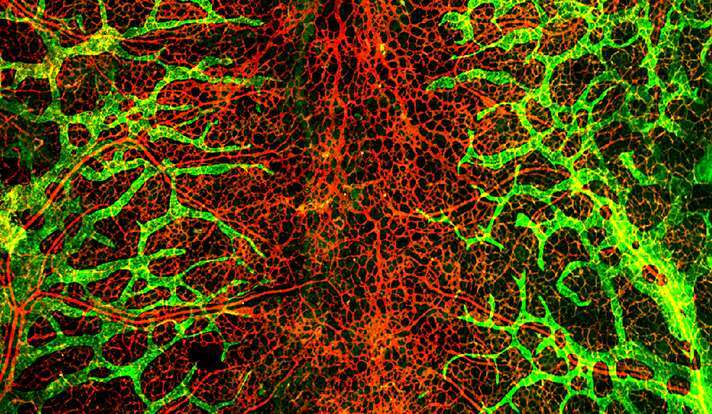 Normal blood vessel growth is regulated by proteins or hormones known as growth factors. Prior to this study, little was understood about the role of a particular family of growth factors, called FGFs, in vascular development. To gain insight a research team, led by Dr. Michael Simons, the Robert W. Berliner Professor of Medicine and Biology at Yale, studied mice genetically engineered to lack FGF signaling in the endothelium, the inner lining of blood vessels. They found that FGFs trigger the expression of a gene (c-Myc) involved in many cancers. The gene sets off a specific chain of events that regulate the metabolism of cells lining the blood vessels. This discovery is significant because it describes a previously unknown link between growth factors and cell metabolism, said Simons. It also pinpoints a pathway for potential therapies. For example, researchers could test drugs that target the pathway to stimulate growth of desirable vessels in cardiovascular diseases characterized by lack of adequate blood flow to tissues, such as coronary or peripheral artery diseases. Another possibility would be to block the pathway in order to treat diseases driven by excessive vessel growth, including cancers and common eye diseases, among many others.